Arriving with so much anticipation; Davido Music Worldwide debuts her first official single which is a collaborative effort from Davido, Mayorkun,Dremo & Ichaba (an affiliate to the recording company). 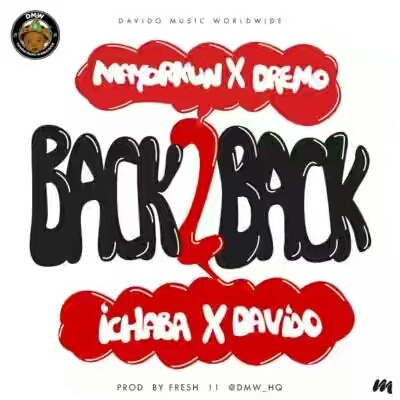 ‘Back 2 Back‘ was produced by Fresh, and sees Davido lead his new boys to score another SMASH HIT. Davido kicked off his new imprint ‘Davido Music Worldwide‘ on a very high note, releasing Mayorkun‘s debut single – ELEKO which went on to hit a million Youtube views in 10 days and has since topped all the reputable music charts from MTV Base to Trace Urban & even the iTunes Nigeria chart. Dremo on the other hand released a cover to ‘Panda‘ titled ‘FELA‘ which has since been getting all the positive reviews & enjoying massive rotation on radio & cable channels. Powerof9ja Entertainment © 2019 - All Rights Reserved.